While this year’s pool of Oscar nominees proved disappointing for those of us who love women directors and their incredible work (really, no Lynne Ramsay? Marielle Heller? Debra Granik? Chloe Zhao? 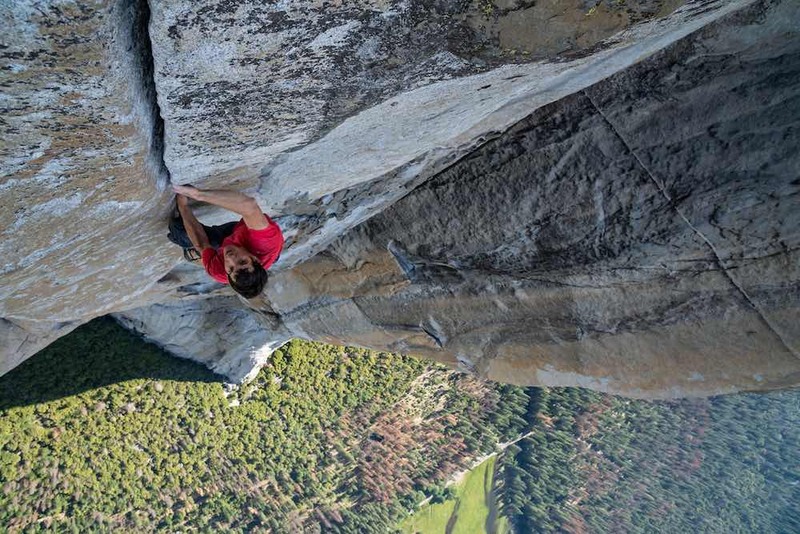 we could go on and on…), major congratulations are in order for Free The Bid director Chai Vasarhelyi, whose gripping, life-or-death documentary Free Solo is up for Best Documentary Feature. 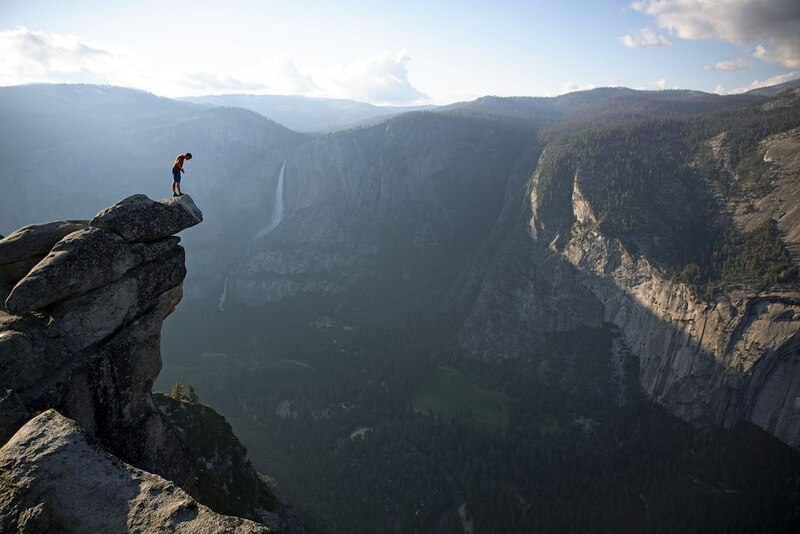 Free Solo follows ambitious rock climber Alex Honnold on his ropeless ascent of Yosemite’s El Capitan, a death-defying feat. 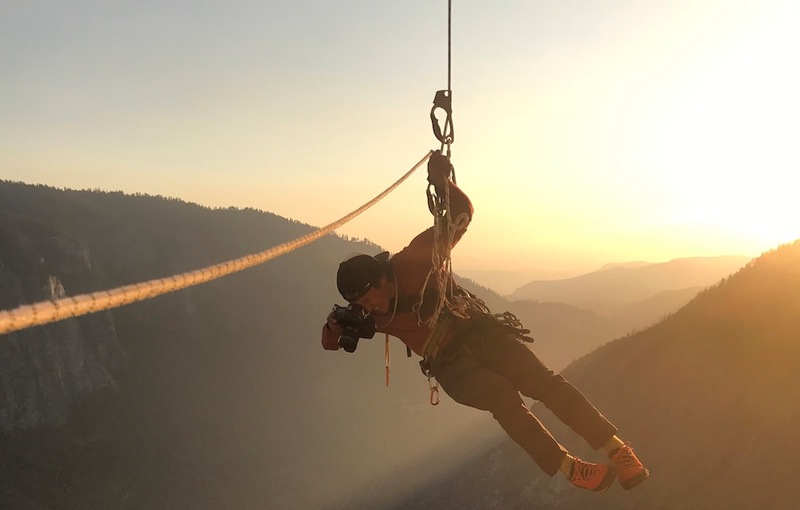 Chai and her husband Jimmy Chin join Alex on his quest; their own grappling with the implications of filming their friend while he undertakes such a dangerous climb become a part of the film’s core narrative. Prior to Free Solo, Chai has been making an indelible mark on the world of documentary film with 2015’s award-winning Meru, also co-directed with Jimmy Chin; her 2003 debut, A Normal Life, which won Best Documentary at the Tribeca Film Festival; and a series of documentaries shot in Senegal – Youssou N’Dour: I Bring What I Love; Touba; and Incorruptible. Beyond her work as a documentarian, however, Chai has brought her cinematic sensibilities and unique storytelling voice to branded projects as well, signing with NonFiction Unlimited for commercial representation. We spoke with Chai about breaking the mold of “bro-heavy” climber films, hearing from viewers how Alex’s story has inspired their own lives, and harnessing the power of human connection in all of her filmmaking. First of all, congratulations on the fact that Free Solo was recently announced as an OSCAR NOMINEE for Best Feature Documentary! How did you react when you first heard the news? I was at home with my family when it was announced that Free Solo was Oscar nominated, and I was thrilled. I’m so grateful to Alex Honnold for inspiring us, and to Jimmy, of course, and the entire Free Solo team. Free Solo has been a huge success in general – can you tell us about the journey that you’ve had with this film since production wrapped? It’s been a whirlwind. Ever since the Toronto Film Fest where we won the People’s Choice Award, it’s been a gratifying road trip. Meeting people at festivals and screenings has been such a positive experience. The response from our audiences has been an outpouring of appreciation about the way they connected and felt so personally inspired by the film, it continues to move me every time. This film isn’t the first time that you’ve explored climbing as a subject matter – you and Jimmy (a climber himself) also co-directed 2015’s Meru, focusing on three climbers ascending Shark’s Fin on Mount Meru. What initially drew you to capture climbing on film and tell stories that center on it as a subject? 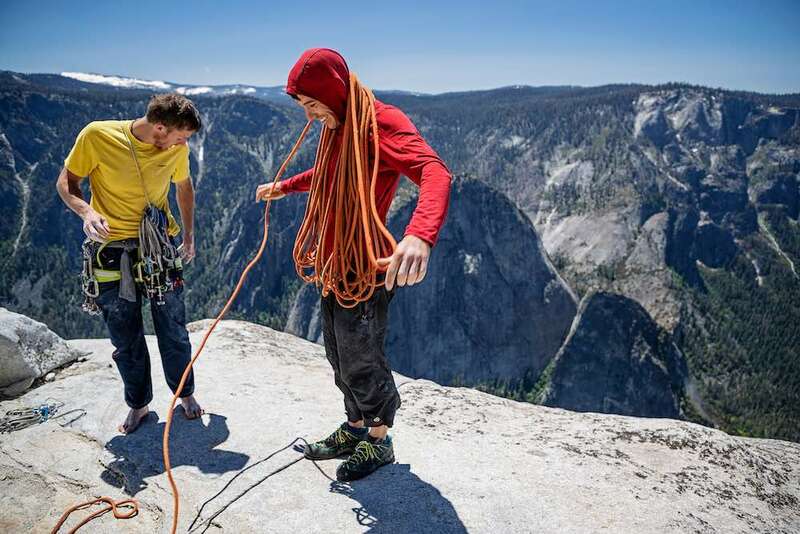 When I started working on MERU with Jimmy, it wasn’t the climbing that drew me to the project. It was about finding the story of the characters and their motivations. Within the families of these men, there’s support but also fear that coexists because the danger is very really. You know, I have skin in the game. I’m in love with a guy who climbs peaks that might kill him, so I needed to try to explain to myself the why of it. Also, I wanted to break the mold of the typically bro-heavy genre of climber cinema and extreme-sports flicks and bring a totally different approach. 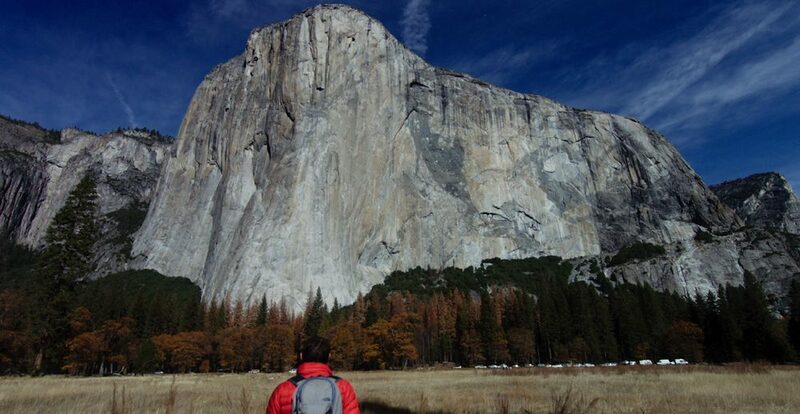 With Free Solo, Alex was thinking about a similarly definitive film as he began to contemplate free-soloing El Capitan. The media often portrays Alex as this kid who is so scared of talking to people that it was easier for him to climb alone, with no ropes, than to ask for a partner. I feel like we all have a story like that in our lives. MERU and Free Solo are about climbers, but at the heart of it, both films are about story. The film crew appears onscreen in Free Solo – how did that decision to break the fourth wall affect shooting? This was a topic we discussed thoroughly and we were originally reluctant to include the crew, but then it became very clear that the ethical question regarding the existential center of the film had to be grappled within the film itself. It was very real that Alex could at any point during his climb fall to his death. Revealing how we were going to film his climb and conversations between Alex and Jimmy, and our crew’s reactions gave us a way to use the crew as a vehicle to tell his story. And also, just from a storytelling point of view, Alex was alone and you need someone to respond to him to help engage and connect with an audience. Jimmy never wanted to be part of the movie, but that’s the wonderful thing about this directing partnership – I was able to express that it’s really really important. And once the decision was made, it was then about how to do it, the moderation, the degree without taking away from your subject itself – it’s hard. But it was effective and became an essential part of the film. Can you take us into some of the unique hurdles that production of a film of this nature posed? It was a monumental operation, as we mostly needed to remain invisible for Alex’s climb. We had five cameramen that were in position on the wall, with only a few hours’ notice and a smaller crew of three on the ground. Covering Alex’s assent was very dangerous. Our worst fear was that he might fall due to some mistake or oversight by the film crew. There was absolutely no margin for error. All of our cameramen were also expert climbers and understood very well the nature of Alex’s risk. There were some very tense moments and a great deal of celebration when Alex reached his goal. What do you think makes Free Solo’s story resonate particularly with audiences? The film has become a respite from the times we live in. Free Solo has nothing to do with politics, so to speak, but the audiences are responding to it because we give people an opportunity to see someone who has this vision and actually does something. He’s able to connect when you don’t think he could connect. Ultimately, it’s about people working together in some way. It’s an inspiring story. When you make your film, you hope that it touches people. But you just never know. We’ve been so moved by the outpouring of young people who say that Alex’s story gives them courage to address the obstacles in their lives. That the impossible somehow becomes possible, that it’s possible to change things. We can all have this vision and work really hard and do something. As you know, Free The Bid was created to address hiring inequality for women directors in advertising. You’re also a commercial filmmaker, signed to the Nonfiction Unlimited roster. How does working between both worlds enrich your craft as a filmmaker? What skills from each do you bring to the other? Whether you’re crafting a documentary or a commercial message, for me, it all comes back again to story. As a filmmaker I’m always looking to create those that truly connect with an audience. The most powerful films are those that make a human connection, and my skills there have application in both worlds. People sometimes think that documentaries aren’t as visual or committed to style as commercials are. But I’ve always approached documentary with a visual eye. Free Solo is a perfect example of that. A human story supported by epic visuals. It’s a combination of all the elements really. Story, cinematography, graphics, and music – it all works together. The skills are the same for both. What kinds of stories are you drawn to telling, in both a documentary context or in terms of commercial work? Does your directorial approach have any hallmarks or recurring elements? Emotional honesty. I’m invested and interested in the character study – what’s the narrative. Often times you’re tempted as a filmmaking to play-up or overstate, but I’m always meticulous and remain true to the story. What are some of the pieces of your commercial work that you feel are the best examples of your vision? I’m very proud of directing the Ralph Gilles story, part of The Art of Design. Gilles is the head designer at Fiat Chrysler and I focused on his design of a new concept car for the automotive company. It’s a character study that touches on creativity and inspiration. Very visual, of course, and an authentic story that reaches an audience beyond car or brand enthusiasts. Who would your ideal commercial client be? I think to create something truly unique you need to take a risk and that is something that I have never shied away from in my long form. I’m drawn to advertisers who are eager to connect in the most authentic way and who are engaged in giving back socially in some way. It’s gratifying to see that list is growing. This sometimes takes going out on a limb a bit. To capture the most jaw dropping visual or unguarded emotions. Creatively, those who are doing work that celebrates the human spirit – character driven stories. In closing, what are your hopes for women directors in 2019 and beyond? That we’ll see a leveling of the playing field. Giving more opportunities to women, or people from a variety of backgrounds means we gain a richness of perspectives and greater understanding of the human condition. It adds diversity to the mix and it makes all of our work even better. It’s not just about inclusion; it’s about excellence of work and equity fosters that.